Taglialatella Galleries in Chelsea is currently presenting several mixed media pieces by Rubem Robierb for an exhibition titled New Works. Known for his vibrantly colored paintings with a hints of a hard New York edge, Robierb unveils paintings that reflect positive and negative changes in pop culture. Some of his most notable works include those in his Power Flowers series directly inspired by Andy Warhol’s famous 1964 Flower series of silkscreen paintings featuring various images of one of nature’s most beloved creations seen in colors such as red, orange, pink, green, silver, and turquoise. Robierb pays homage to Warhol's series of individual hand painted & silkscreen works on canvas, including single flowers and other compositional orientations resembling Warhol’s, but with a twist on the actual imagery itself: each flower in his series derives from a photograph of what a bullet looks like after being fired under water with the impact transforming a recognizably intense and violent figure into a floral-like creation with beautiful, blossoming petals. What’s different about these flowers however is that Robierb made the image appear to be the result of a gunshot explosion with the center of the flower representing the bullet hole and the petals representing what a lead bullet looks like after being shot into the water. 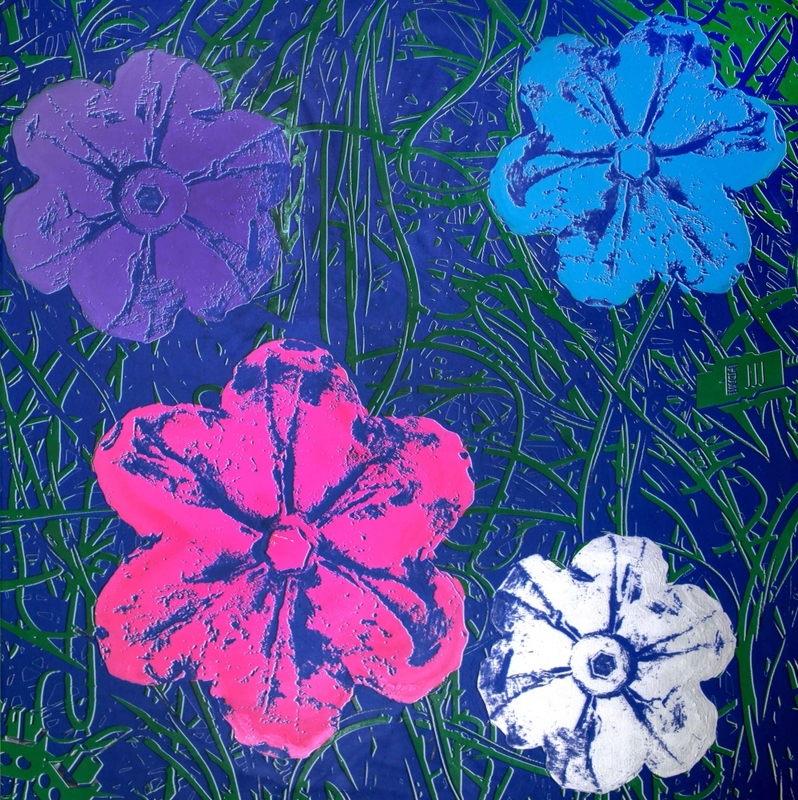 Andy Warhol’s famous Flowers series was also a major inspiration to Robierb as is seen in works like War-Hol Flowers (Blue and Green) and War-Hol Flowers (Blue and Silver) with four flowers arranged just like Warhol had them. He also makes use of positive and negative space with the starkly contrasting colors in his images of flower vases such as red against blue and black against white in his Rose Bouquet series and his Flower Vaseseries. The vases are actually hand grenades. They include powerful messages like “Danger, High Voltage” featuring a blue heart with bolts of electricity flashing, while others display messages like those you might see in storefront windows like “Sorry, Cash Only,” “Not For Rent,” and “Open, 24 Hours.” Other heart images display more personal messages like “Forever” or “Follow Me” lit in bright lights against a white heart, “You” in which the inside of the heart is filled with Pac-Man characters with red ones in the center forming the message. At Taglialatella Galleries, 231 Tenth Ave. (at 23rd St.) through Jun. 9. The gallery is open Mon. - Sat. from 10 a.m. - 6 p.m. and Sun. from 11 a.m.- 5 p.m. and by appointment.